If the table is to be covered, have it the proper size, and the silence cloth and luncheon cloth straight and smooth, as before. In the center of the table place flowers, fruit, or something of the kind, tastefully arranged. At the foot of the table, place a mat for the platter holding the croquettes, and lay a spoon at the right and a fork at the left of the dish. At the head of the table place a stand for the cocoa pitcher, and beside it place the sugar bowl, spoons, teacups, etc. A stand for a cocoa or coffee pot should correspond with the pot, to be as inconspicuous as possible. Use individual salts, or place salt and pepper for each two persons. Place a luncheon plate for each person, observing the same exactness as is always necessary in setting the table. At the right of each plate place a luncheon knife, a knife for butter (if a separate knife is used), a soup spoon, and a water glass, observing the same rules as before. At the left lay the luncheon fork, a salad fork, a napkin with the bread sticks or toast fingers for the soup, and the bread and butter plate, if used. Place the dessert plates and forks on the sideboard. See that the soup dishes are hot. Ascertain whether there will be any delay. Fill the water glasses, and announce the meal. 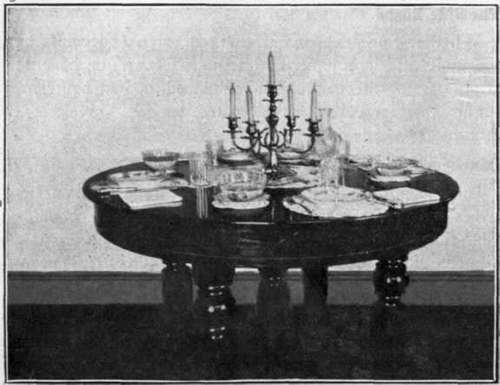 As soon as the guests are all seated, if the soup is to be served from the butler's pantry, the waiter brings a dish of hot soup on a small silver tray, passes to the right side of the guest at the host's right hand, and places the soup dish quietly on the plate. If the soup is to be served at the table, bring the soup tureen on the tray, and place it in front of the hostess. Remove the cover, and put it on the side table. Lay the soup ladle beside the tureen at the right, and place the warm soup plates conveniently at the left. The waiter should stand at the left of the hostess, and as soon as a dish of soup is served, take it up with the right hand, pass and place it as before. To remove the soup course, place the tureen on the tray, lay the ladle beside it, and carry out. To remove the plates, put the spoon in the dish, and take the luncheon plate with the soup dish. Carry one in each hand, and remove quietly. Always place and take at the right, but when passing a dish, offer it at the left. The potatoes may be brought and placed covered on the side table, and passed by the waiter after the croquettes, or put on the plate with them. Bring in the croquettes and potatoes, and place the dishes on mats. Place a spoon beside the potato dish. Put a pile of warm plates at the left of the platter. As soon as a plate is served with croquettes and potatoes, pass and place in front of the lady of the house, unless there are guests who should be first served. Wait upon each person at the table in the same way. Pass the bread, and place the butter as it is served by a member of the family. The tomatoes have been previously served cold on salad plates, and set in a convenient and cool place. Set a plate before each person, and pass the vinegar or other dressing which is to be used with the tomatoes. To remove the course, place the serving fork and spoon on the platter, place the platter and fork rest on the tray, and carry away. Return for the potato dish and the bread. Remove the soiled dishes one in each hand, as before. Remove the butter, salt, and pepper, and any silver that has not been used. Remove crumbs from the polished table with fringed napkin and crumb tray. From the tablecloth take crumbs with silver crumb knife and tray. Place the pie before the hostess, and on the right put a silver knife, and on the left a pie fork. Place a pile of dessert plates conveniently at her left. As soon as a plate is ready, place a fork on it and pass to the right of the guest, and set it down. Serve each person the same way, and pass the cheese. If a cup or glass needs replenishing, attend to it at once, at any time during the meal. A dinner is more elegant if a handsome and expensive plate is at each place when the table is set. These are removed by the waitress as she places the dishes of the first course. Whether a carving cloth is used depends upon whether the carving is done at the table. Sometimes fashion decrees that if a man is not a good carver, it is perfectly good form to have the roast brought to the table carved, and held in place by decorations of a suitable kind.